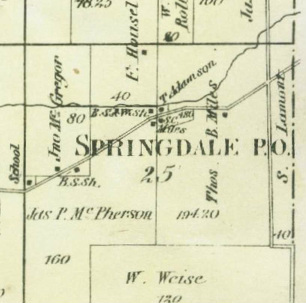 Established in 1850, this was the first official post office in Springdale. Thomas B. Miles was the first postmaster. After he resigned in 1866, J.P. McPherson became the postmaster. It was in the "Pioneer Scottish Settlement" which included the Presbyterian Church, Henderson School, and McPherson/McGregor School. The post office closed in 1890.